The scientists tested a variety of emollients, some of which are commonly used for treating skin conditions such as eczema and psoriasis. The findings have been published in the Fire Safety Journal and were presented at the UK Association of Fire Investigators conference in Leeds last week. 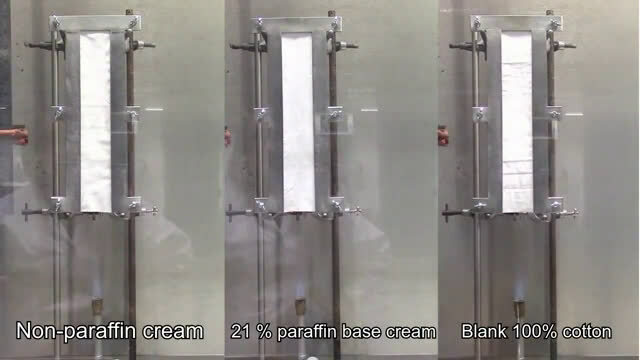 Initial work focused on creams, lotions and ointments with a paraffin base, but their recent laboratory research has indicated that the presence of paraffin-free emollient increases the flammability of fabrics. Dr. Sarah Hall and Joanne Morrissey of Anglia Ruskin University measured the time it takes for fabrics—including cotton of different thread counts and polyester-cotton blend—to ignite once contaminated with an emollient and in close proximity of a naked flame. Non-contaminated fabrics took an average of 65 seconds to ignite, while those containing emollient residue, from both paraffin and paraffin-free creams, caught fire in less than 20 seconds. Dr. Hall, Senior Lecturer in Forensic Science at Anglia Ruskin University, said: "We were driven to carry out this work following a couple of tragic cases reported to us by Essex Fire and Rescue Service that were linked to fires and the use of emollients. Since then we have worked jointly with Essex Fire and Rescue, London Fire Brigade and West Yorkshire Fire and Rescue Service. "Our initial research focused on the range of paraffin-based creams, as this seemed the most obvious reason for flammability. However, we are now seeing that fabric that has been in contaminated with any of these creams reacts in a similar way. "We are now carrying out further research to try and identify any common ingredients as well as the best ways of removing the residue from clothing and bedding, for example the ideal washing temperature." Watch Manager Chris Bell, West Yorkshire Fire and Rescue Service and National Fire Chiefs Council Emollient Lead, said: "We welcome the report from Anglia Ruskin University and we thank the researchers for their commitment to exploring this issue further. "We want to reassure people that emollients are safe to use. They are an effective treatment for skin conditions so people should continue to use them. "However, people should be aware that when using emollients they can come into contact with fabrics, clothing, bedding or bandages which then dries leaving a flammable residue. The fabric can then be easily ignited with smoking materials such as matches and lighters, naked flames or other heat sources. "We are asking people who prescribe, dispense or apply these products to be aware that switching to a lower or paraffin-free emollient will not reduce the fire risk. Washing fabrics will reduce the risk but may not totally remove it."